Please join School of Law faculty for a discussion of President Trump's Executive Orders regarding immigration law, immigrants' rights, and human rights. The UC Davis Law Review is celebrating its fiftieth volume by launching an online companion edition: the UC Davis Law Review Online. The online journal will print short, timely pieces—including essays, responses, replies, and book reviews—at lawreview.law.ucdavis.edu/online. "We are hoping that the UC Davis Law Review Online will be able to grow into a robust and active forum for engaging legal scholarship above and beyond the articles in our traditional print edition,” says Volume 50 Editor in Chief Lars Torleif Reed. For example, Dean Steven W. Bender from Seattle University School of Law spoke at the Law Review’s 2016 Symposium, Disjointed Regulation: State Efforts to Legalize Marijuana, and published his article “The Colors of Cannabis: Race and Marijuana” in the December 2016 print issue. The new online edition allowed him to reflect on the implications of the 2016 elections in a follow-up piece. It will also allow scholars to respond to pieces in both the print and online journals without the time delay of print publishing. The Law Review launched its online edition along with its completely redesigned website, lawreview.law.ucdavis.edu. Reed, Projects Editors Parnian Vafaeenia and Andrew Aaronian, and Managing Editor Markie Jorgensen developed the online journal and website along with the School of Law’s Senior Graphic Designer Sam Sellers and Web Application Developer Jason Aller. The editors and members of the UC Davis Law Review will staff both the print and online editions. Tomorrow brings "Documenting the Immigrant: U.S. Immigration Policy Past, Present, and Future," a major conference organized by the UC Davis Institute for Social Sciences with co-sponsors including the School of Law. 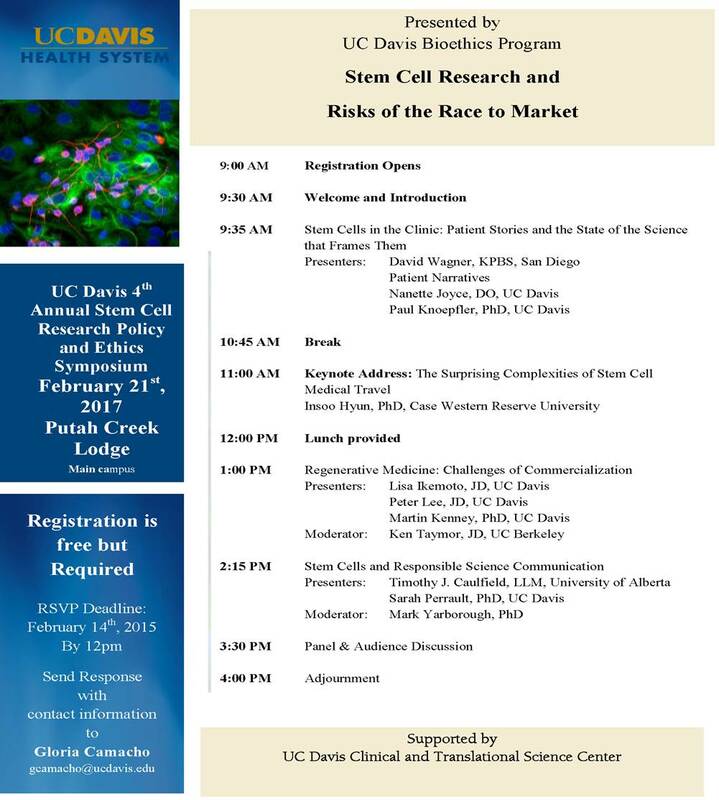 I will speak on a panel in the afternoon. This one-day conference, hosted by ISS, will bring scholars from multiple disciplines together with policy activists, journalists, and individuals connected to the legislative environment to explore U.S. immigration policy since 9/11 and address the implications for immigration policy of the Trump presidency. 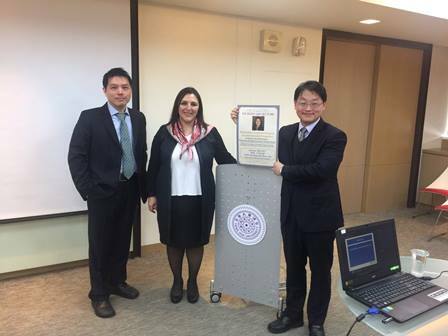 I had the honor of serving as a visiting scholar at National Chiao-Tung University, Taiwan during the week of January 8th. My visit was coordinated by Professor Chien-Chung Lin, who has twice visited UC Davis School of Law to present papers at the American Society of Comparative Law (ASCL), Younger Comparativists Committee (YCC) Workshop on Comparative Business and Financial Law. 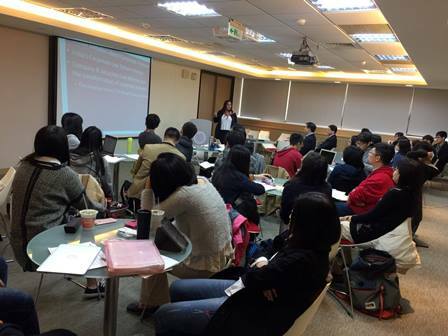 Taiwanese corporate law scholars such as Professor Lin have been doing excellent work especially in the area of comparative corporate law, so I was very much looking forward to interacting with some of them. I began my visit with a fabulous lunch organized by Professor Lin and our own UC Davis JD student, Oscar Yang (himself a 2016 graduate of our LLM program). Oscar and Professor Lin had graciously invited leading Taiwanese lawyers for the lunch, including Prosecutor Jawyang Huang, Taipei District Prosecutors Office. Mr. Huang has been a visiting scholar at Yale University School of Law and was Oscar's supervisor in the Office of Trade Negotiations, in charge of WTO dispute settlement cases. We were joined by two of Oscar's former colleagues who were both fabulous company, Ms. Jenny Van, Senior Legal Adviser in Office of Trade Negotiations and Mr. Jason Lai, Secretary to the Director-General of Bureau of Foreign Trade. It was a terrific lunch at one of Taipei's most popular restaurants, Din Tai Fung. After the lunch Mr. Huang gave me a fascinating tour of the Taipei Judicial Building, where I was able to observe a few trials that were being conducted. The efficiency and order at the judicial building was quite impressive. After the first day in Taipei, Professor Lin took me to Hsinchu, one of the educational centers of Taiwan. The city has several prestigious universities, including National Chiao Tung University and National Tsing Hua University. Hsinchu is also an economic and technology hub in Taiwan with an impressive science and technology industrial park. The science and technology park is home to hundreds of high technology companies including world-renowned firms in the semiconductor space such as TSMC and UMC. Professor Lin gave me a tour of the technology park and given my prior corporate practice experience in the semiconductor space I was quite excited to see the place! In Hsnichu, I gave three lectures at the two law schools there. 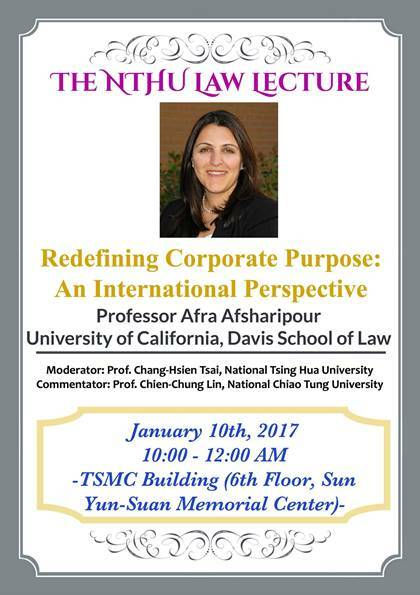 Redefining Corporate Purpose: An International Perspective, at the Institute of Law for Science & Technology, College of Technology Management, National Tsing Hua University in Hsinchu, Taiwan. My visit to National Tsing Hua University was coordinated by Professor Robert Tsai, who is trained as an attorney in both Taiwan and the U.S. The lectures were well-attended, and the audience of professors and law students asked excellent questions. I also had the opportunity to visit the Taiwan Stock Exchange to learn more about the significant corporate governance initiatives undertaken in Taiwan. I had an informative meeting at the Taiwan Stock Exchange with Mr. Joe Tsun Cheng (Senior Vice President, Corporate Governance Department) and Ms. Tracy Chen (Associate, Corporate Governance), as well as meeting Mr. Lih Chung Chien, Senior Executive Vice President of the Taiwan Stock Exchange. At the meeting we exchanged views on corporate governance initiatives undertaken in Asia, and I detailed some of my scholarly work on the trajectory and possible outcomes of the corporate governance reforms undertaken in India over the last decade. I really enjoyed the intellectual engagement with the professors, lawyers and law students I had the privilege to meet. Professor Lin had also kindly arranged many opportunities for me to experience the beauty and culture of Taiwan, including visits traditional tea houses, temples and the CKS Memorial Hall and Liberty Square, an afternoon at beautiful hot springs outside of Taipei, a culinary adventure with law students at one of Taipei's fabulous night markets, a tour of the National Palace Museum, several informative walks around the different districts in Taipei, and more delicious meals than I can count. I could easily have spent weeks enjoying all that Taiwan has to offer from its vibrant coffee culture to its elegant tea houses and lush country side, all topped off by the generous hospitality and friendliness of its people. If it is not already clear, the trip to Taiwan was truly inspiring, and I look forward to future visits! On Tuesday, the Supreme Court of the United Kingdom gave its judgment in Belhaj v. Straw and Rahmatullah v. Ministry of Defence, two human rights cases brought against UK officials in UK courts. Plaintiffs did not claim that UK officials were the main actors in the alleged human rights violations, which included unlawful detention, rendition, and torture. Rather, plaintiffs claimed that UK officials had assisted other countries-principally, the United States and Libya-in committing such violations. The UK officials argued that a court could not decide the assistance claims without ruling on the legality of other countries' actions and that the cases should therefore be dismissed on grounds of state immunity or under the foreign act of state doctrine. But the UK Supreme Court unanimously rejected these arguments. This means that the claims may proceed to trial where the actions of the United States, Libya, and other countries may be reviewed. Lord Mance gave the leading judgment, with concurring judgments by Lord Neuberger and Lord Sumption. The state immunity question was whether the suits against UK officials indirectly impleaded foreign states because, in order to maintain their claims against the former, the plaintiffs would have to show that the latter acted unlawfully. The act of state question was whether an English court should abstain from adjudicating upon sovereign acts committed by a foreign state, even outside its own territory. How does the reasoning in Belhaj compare to the approach taken in the United States? What insights might we derive from the UK Supreme Court's treatment of these areas of law and the role of the judiciary in adjudicating questions that implicate international relations? The UK Supreme Court found the state immunity question to be quite straightforward. No foreign states had been directly impleaded because no claims had actually been brought against them. No foreign states had been indirectly impleaded "because the legal position of the foreign states" would not be affected by the suits. Para. 31 (emphasis added). The Court distinguished past cases in which foreign states were indirectly impleaded because the claims involved property in which the states had an interest. "The present appeals involve no issues of proprietary or possessory title. All that can be said is that establishing the appellants' liability in tort would involve establishing that various foreign states through their officials were the prime actors in respect of the alleged torts." Para. 29. Such "reputational" harm was not sufficient. Para. 29. As Lord Sumption put it in his concurring opinion: "No decision in the present case would affect any rights or liabilities of the four foreign states in whose alleged misdeeds the United Kingdom is said to have been complicit. The foreign states are not parties. Their property is not at risk. The court's decision on the issues raised would not bind them." Para. 197. The foreign act of state doctrine in the United Kingdom, on the other hand, has historically been quite different from the act of state doctrine in the United States. To give two obvious examples: (1) one strand of the UK act of state doctrine is not limited to acts performed within the foreign sovereign's own territory, see Buttes Gas and Oil Co. v. Hammer (No. 3)  AC 888, while the US act of state doctrine is so limited; and (2) the UK act of state doctrine contains a public policy exception, see Oppenheimer v. Cattermole  AC 249; Kuwait Airways Corp. v. Iraqi Airways Co.  2 AC 883, which the US act of state doctrine does not. Each of these differences played a key role in Belhaj. The three reasoned judgments did not entirely agree about how to organize the past cases-Lord Mance divided the foreign act of state doctrine into three types, Lord Neuberger into four, and Lord Sumption into two-nor did they agree about the proper terminology. But in the end, all members of the Court agreed on the key points and on their application to these cases. Certain strands of the UK act of state doctrine are territorially limited (specifically the first two types identified by Lords Mance and Neuberger, which Lord Sumption called the "municipal law act of state doctrine"). These strands were thus inapplicable to those claims that involved acts-particularly those of the United States-outside the foreign sovereign's own territory. But each of the judgments also identified a strand of the act of state doctrine that is not territorially limited (specifically the third type identified by Lords Mance and Neuberger, which Lord Sumption called the "international law act of state doctrine"). This strand originated in Buttes Gas and applies to cases "where an issue is said to be inherently unsuitable for judicial determination by reason only of its subject matter." Para. 43 (quoting Shergill v. Khaira  AC 359). Critically, however, Lords Mance, Neuberger, and Sumption agreed that each strand of the foreign act of state doctrine was subject to a public policy exception and that the exception should apply in these cases. (Lord Mance preferred to view the exception as a limitation on the ambit of the doctrine, but did not think the distinction between ambit and exception was critical. Para. 89.) Thus, Lord Mance wrote: "The critical point in my view is the nature and seriousness of the misconduct alleged in both cases before the Supreme Court, at however high a level it may have been authorized. Act of state is and remains essentially a domestic law doctrine, and it is English law which sets its limits. English law recognizes the existence of fundamental rights, some long-standing, others more recently developed." Para. 98. Lord Neuberger similarly reasoned that, "assuming that the claimants were detained, kidnapped and tortured as they allege, the public policy exception would apply." Para. 168. And Lord Sumption said that the foreign act of state doctrine could not be applied to detention and torture because both "exhibit the same combination of violation of peremptory norms of international law and inconsistency with principles of the administration of justice in England which have been regarded as fundamental since the 17th century." Para. 278. Despite their agreement on the most important aspects of the case, there were some notable differences in approach. Lord Mance thought that "[t]he concept of foreign act of state needs to be disaggregated, or broken down, and approached at a more particular level of enquiry." Para 11(ii). For him, too much generalization "blurs the distinctions between different types of foreign act of state" and "impedes the important task of identifying the scope and characteristics of each type of foreign act of state." Para. 40. Lord Sumption was more inclined to generalize: "It is always possible to break down the cases into different factual categories, and deconstruct the law into a fissiparous bundle of distinct rules. But the process is apt to make it look more arbitrary and incoherent than it really is. I think that it is more productive to distinguish between the decisions according to the underlying principle that the court is applying." Para. 227. Lord Sumption's approach made him somewhat less likely to insist on all of the limitations to the act of state doctrine that might be found in past cases, for example the limitation of the territorial strands of the act of state doctrine to rights in property. See para. 231. In approaching the question of public policy, the judgments also laid different emphases on domestic and international law. Lord Mance preferred to look "to individual rights recognized as fundamental by English statute and common law, rather than to tie them too closely to the concept of jus cogens." Para. 107. Lord Neuberger agreed that the public policy exception should "depend ultimately on domestic law considerations," but added that "generally accepted norms of international law are plainly capable of playing a decisive role." Para. 154. Lord Sumption, on the other hand, looked primarily to whether international law had been violated in deciding whether to apply the public policy exception, see paras. 249-80, though even he acknowledged that "the influence of international law does not mean that every rule of international law must be adopted as a principle of English public policy." Para. 257. The three reasoned judgments also took different views on the relevance of foreign act-of-state decisions. Lords Mance and Sumption each discussed the US cases at length, see paras. 47-56, 209-212, as well as cases from Germany, France, and the Netherlands, see paras. 67-72, 201. Lord Mance cautioned that US law was "not necessarily transposable to English law," para. 57, but also said "we should be unwise not to take the benefit of it." Para. 57 (quoting Buttes Gas and Oil Co. v. Hammer (No. 3)  AC 888). Lord Sumption disapproved of the flexible US approach expressed in Sabbatino, see para. 212, without mentioning the US Supreme Court's more recent decision in Kirkpatrick, which is rather less flexible. He seemed to prefer the "instructive" approach of the French and Dutch courts. Para. 201. But Lord Neuberger advised "great caution before relying on, let alone adopting, the reasoning of foreign courts in connection with the Doctrine." Para. 133. He found the US decisions "to be of very limited assistance." Para. 134. One thing that all three judgments agreed on, however, was that the act of state doctrine is a doctrine of domestic rather than international law. Drawing a distinction with state immunity, Lord Mance noted early in his judgment that "foreign act of state in most if not all of its strands has been developed doctrinally in domestic law." Para. 7. Lord Neuberger wrote that "the Doctrine is purely one of domestic common law." Para. 118. And Lord Sumption added that "[t]he act of state doctrine . . . does not reflect any obligation of states in international law." Para. 261. As I have noted in other writing, the act of state doctrine is a doctrine of international comity rather than international law. I wrote there (p. 2077) that international comity "describes an internationally oriented body of domestic law that is distinct from international law and yet critical to legal relations with other countries." The fact that a particular doctrine is based on international comity does not mean that it must give a decisive role-or indeed any role-to the executive branch; many comity doctrines, from the conflict of laws to the enforcement of foreign judgments to the doctrine of forum non conveniens, are administered entirely by courts (pp. 2132-40). With respect to the act of state doctrine, one US Court of Appeals has recognized an exception allowing the executive to waive the doctrine, see Bernstein v. Nederlandsche-Amerikaansche, 210 F.2d 375, 376 (2d Cir. 1954), but the US Supreme Court has never approved it and has rejected a broader role for the executive in determining when the doctrine applies. See W.S. Kirkpatrick & Co., Inc. v. Environmental Tectonics, Intern., 493 U.S. 400, 405, 408-09 (1990). Before we leave the three judgments in Belhaj, it is worth noting that each of them rejected the possibility that the act of state doctrine should apply whenever the Foreign Office indicated that the case would embarrass the United Kingdom in the conduct of its foreign relations. Lord Neuberger was willing to list this as his "possible fourth rule," para. 124, but found "little authority to support the notion that the fourth rule is part of the law of this country." Para. 132. Allowing the executive to dictate to the judiciary, he thought, "would be quite unacceptable." Para. 149. Lord Mance similarly saw "little attraction in and no basis for giving the Government so blanket a power over court proceedings." Para. 41. And Lord Sumption felt that allowing the act of state doctrine to turn on the degree of embarrassment to the government "would not be consistent with the accepted principles governing the relations between the courts and the executive in England." Para. 212. The fact that a particular doctrine is based on international comity does mean that each country is free to shape the doctrine as it thinks best. Whether one feels that it is instructive to look to the experiences of other countries or not, the simple fact is that the act of state doctrine is quite different in different countries. In contrast to the United Kingdom, the United States does not recognize a non-territorial strand of the act of state doctrine and limits the doctrine to "the official act of a foreign sovereign performed within its own territory." W.S. Kirkpatrick & Co., Inc. v. Environmental Tectonics, Intern., 493 U.S. 400, 405 (1990). On the other hand, the US version of the doctrine has no public policy exception; if the act of state doctrine applies, a US court must accept its validity "[h]owever offensive to the public policy of this country" it may be. Banco Nacional de Cuba v. Sabbatino, 376 U.S. 398, 436 (1964). Still, it seems likely that US courts would not recognize fundamental violations of human rights as acts of state to begin with. See Kadic v. Karadzic, 70 F.3d 232, 250 (2d Cir. 1995) ("we doubt that the acts of even a state official, taken in violation of a nation's fundamental law and wholly unratified by that nation's government, could properly be characterized as an act of state"). These differences among nations make the act of state doctrine a fascinating topic for comparative study. They also reinforce the point that the act of state doctrine is one of international comity rather than international law. 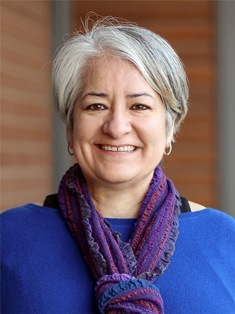 Professor Leticia Saucedo will deliver the Alice Cook Distinguished Lecture at Cornell University on April 13, 2017. Saucedo will deliver a lecture titled, "The Legacy of the Immigrant Workplace: Lessons for the 21st Century Economy." The Alice Cook Distinguished Lecture is organized by the ILR School of Cornell University. ILR is a leading college of the applied social sciences focusing on work, employment, and labor policy issues. I have attended the Association of American Law Schools annual meeting for many of the 17+ years I have been a law professor, but I experienced something at last week's annual conference in San Francisco that I had never before seen or heard, something that came as a pleasant surprise. Attendees were actually talking about rural people and places--including in a plenary session on the future of the legal profession. For more than a decade now, I have worked to establish as a sub-discipline what I call "law and rural livelihoods" (I've taught a seminar by that name for eight years), and my Legal Ruralism blog is part of that effort. One of my overarching arguments is that most legal scholarship implicitly embraces an urban norm--and that some legal scholarship is explicitly urbanormative. Yet in all my years of attending gatherings of law professors, I have consistently been the only person in the room talking about rural people and places--I've literally been the only person using the word "rural." I've often joked that I'm the "rural lady," perhaps analogous to SNL's "church lady," a character with a one-track mind who keeps showing up and making the same overarching point. Over the years, this approach has attracted a lot of eye-rolling, ongoing marginalization. But it has remained the case that rural people and places have been omitted from so many scholarly conversations about law--and from so many scholarly works on topics that, to my mind, have an obvious rural or spatial angle, e.g., reproductive justice, poverty. So, imagine my surprise when, following the plenary on "Preparing a Diverse Profession to Serve a Diverse World," with key note by Brad Smith, President and Chief Legal Officer of Microsoft Corporation (and, incidentally, my boss at Covington & Burling London in 1992 and later my client, from 1996-98, when I returned to Covington and he was in house at Microsoft), Lauren Robel of Indiana University School of Law asked the first question, which was essentially "what about rural?" She noted that she had recently been in southern Indiana, which is quite rural, and that shortages of broadband and lawyers are two challenges plaguing the region. She also referenced the recent NPR story about the "epic" shortage of rural lawyers, a story that quoted me and mentioned the work I have done on the rural lawyer shortage. After Robel broke the ice with a reference to rural Indiana, several others referenced "rural" in the ensuing conversation. This was interesting in part because Smith had, early in his talk, referenced a small town in southwest Virginia where Microsoft has a server farm, but he had not used the word "rural." As the conversation unfolded, however, the word became part of the discussion in a way that seemed, well, natural. This was somewhat similar to what had happened the day before in a discussion session in which I participated: Community Development Law and Economic Justice--Why Law Matters. About a dozen scholars were invited in advance to participate in this discussion, including me. Because I don't "do" community development law or work as such, I assumed I was invited to participate because of my work on rurality, including rural poverty, thus implicating issues of economic justice. Once I got the ball rolling by talking about my rural-focused scholarship, several other participants mentioned "rural," including "rural and urban," as in referencing the prospect of intra-regional CED collaborations and such. (Let me be clear that this usually doesn't happen; when I'm on a panel talkig about "rural," I typically remain silo-ed as such). I commented that I thought much of the attention to "rural and urban" was racially coded (though it is not necessarily accurate to conflate rurality with whiteness, it is a common phenomenon), as a way to get at cross-racial collaborations, which I very much support (indeed, cross-racial cooperation among low-income folks is a big focus of my scholarship right now). I also joked that I had not heard as many mentions of "rural" in my entire 17 years of attending law prof. conferences as I had in that 1.75 hour-long session! Perhaps colleagues in this session--where I was invited to the conversation because I am a ruralist--were humoring me. So, is this attention to rurality among legal educators the wave of the future? or just a temporary dalliance, a moment of intrigue and curiosity, as we absorb the results of the 2016 election and the role that rural America apparently played in Trump's win? I'm hoping for the former because mainstream (even liberal! highly educated! elite!) attention to rural issues and rural people might help us avert another electoral disaster in two years, or four. Faculty from UC Davis School of Law will have a prominent presence at the 2017 Association of American Law Schools (AALS) Annual Meeting in San Francisco this week. Here is a list of King Hall-related faculty activities. SECTION ON LAW AND THE SOCIAL SCIENCES - How Can Social Science Improve Judicial Decisionmaking? SECTION ON LAW AND RELIGION - Is Securalism a Non-Negotiable Aspect of Liberal Constitutionalism?